I admit it. I get easily excited. My expectations about an event—whether it's a birthday, Christmas, vacation, outing—often build to colossal proportions. The problem with having huge expectations is—it can set the stage for disappointment. 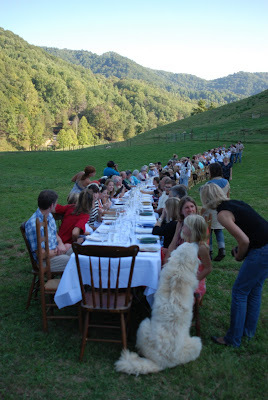 So, when I read about a farm dinner in North Carolina, my husband was skeptical. Knowing how my enthusiasm takes flight, he envisioned an overpriced rustic meal, swatting mosquitoes while listening to pretentious foodies debate the merits of arugula versus mizuno. Meanwhile, I fantasized about bonding with farmers and talking tomatoes into the wee hours while sipping wine under the stars. No amount of imagination could prepare us for our blissed-out reality. Outstanding in the Field (OITF) is a “roving culinary adventure,” to quote the website. 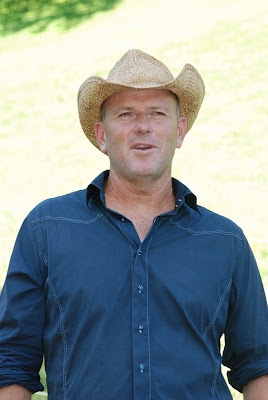 Founded in 1999 by Californian Jim Denevan as a way to connect food lovers with food origins, the elaborate field dinners showcase and honor local farmers, growers, food artisans, and chefs. Denevan is a dreamer—a chef, land artist, surfer, cowboy-hat-wearing showman. His dinners draw locavores in droves to dine with the folks who raise the meat, grow the tomatoes, bake the bread, and process the cheese. The ingredients for the dinner are local, and diners break bread with the bakers who prepared it. Denevan and his crew travel the country via the OITF bus, with dinners originating each season in California, cruising their way across the country, then heading back to home base. In the 2010 season, OITF will host 68 dinners, with the majority of the events sold out. Central to the experience is the long table. It stretches throughout fields, curves within coves, and serpentines through stalks. The long table awaits, outfitted in stark white cloth, spare and minimal to showcase the surroundings. And the food. Oh my. The food. After dropping the kids off at my sister's house, we raced two hours into Marshall, North Carolina, winding our way up mountains...and wondering how we'd survive our way down after a wine-laden meal. Passing pristine farms and those harboring an abundance of old tires in front yards, we followed the signs to East Fork Farm...waiting for the mountains to open up to farmland. Of course, when you raise sheep, you don't really require a flat field. Instead, we parked and walked up a hilly road, where our chauffeur awaited. There's something about a tractor ride that just makes people immediately friendly. Maybe it's the fact that you're basically sitting on a stranger's lap, or maybe it's the intertwining of arms around shoulders to brace for those rough bumps, hoping that your Secret Powder-fresh Scent holds out. Maybe it's the determination to have a great time, based of the price of the tickets. Whatever it is, we became buddies with our tractor-mates before the first sip of wine. Surprisingly, especially for those of you who know us—we were among the first diners to arrive. Which provided ample opportunity to chat, drink, and start snacking. Our first little tasty treat originated a few feet from our gathering place. While we waited for all of the guests to arrive, we gathered in a field near a sheep-filled enclosure, which overlooked a smallish pond. Which had trout. Which turned into smoked trout rillettes. We knew after that first bite my expectations were totally realistic. Have you ever met someone and knew that if only you lived next door, that person would be your instant best friend? Have you ever looked at a child and thought how much she loves everything your own child adores? Did you ever just want to throw rational thinking into the pond with the trout and pick up and move? Huh. I realize I sound a little stalker-ish. Honestly, though, you would understand if you met the Robertson family. Stephen, Dawn, and their adorable girls welcomed us to their farm as if we were their dearest friends. Of course, there were 120 diners, so I suppose I'd have competition to be Dawn's new BFF. East Fork Farm, the Robertson's home and livelihood, is located in the mountains of Madison County, NC, about 25 miles north of Asheville. The farm produces pasture-raised lamb, free-range poultry, rabbit (of which they are developing a prototype for a free-range environment,) and pond-raised trout. All products are free from added hormones or antibiotics, and the farm is certified Animal Welfare Approved. The Robertson's commitment to sustainable farming practices produces superior tasting, healthy meat products, while preserving and enhancing the ecological health of the farmland and water. For 13 years, the Robertsons have enjoyed a symbiotic relationship with the land—growing a family business while maintaining their commitment to treat the land with respect. Can't you imagine Kristen and this sweet pea being best friends? After our farm tour (and several glasses of Alain Patriarche, Aligote, Bourgogne 2008), our hosts led us to the field. The first sight of the long table, slightly curving through the field, sheep grazing on the hill behind, was breathtaking. Then, practicality set in, and I realized I needed to sit with my back to the lambs. Sorry, but I didn't think I could eat their brothers and/or sisters with them watching. I know, I know. Roll your eyes. There is a lovely Tradition of the Plates at OITF dinners. Guests are asked to bring their own plates to the dinner, providing an eclectic mix of china and earthenware. The couple across the table from us stopped by an antique store and bought two plates. The woman's family had collected china by this particular American china manufacturer for three generations, and she delighted in telling me all about her collection. We forgot plates in our rush to grab blue blankey, Nintendo DSs, and books for the kids to take to their aunt's house. No fear. The OITF crew provides extra plates for slackers like us. My plate reminded me of a grandmother's china...Peter's was decorated with seashells. Perfect. Whew. I worried we might be eating off of non-sustainable Chinette. Wild mushroom tart, mountain basil, mesclun greens, roasted beet vinaigrette, mixed organic radishes. OITF works with a renown local chef in each dinner location, as well as local food artisans. Our brilliant chef, William Dissen from The Market Place restaurant in Asheville, is committed to local foods. As owner and Executive Chef of The Market Place, Dissen serves food produced and grown within a maximum 100-mile radius of Asheville. Within that radius, our dinner included cheeses from Three Graces Dairy; Wake Robin Farm Breads; produce from Jake's Farm; meats from our hosts; and wines from France. Well, OK. That's a tad outside the 100 miles, but I'm not complaining. Trust me. Pinot Noirs to die for. Truly, beyond the amazing food and wine, my favorite parts of the evening were all about the people. The connections. Chef Dissen brought along a fabulous staff who shared stories about each course—where it came from, how it was prepared, the special herbs used, the history of the wines. It was like dinner and storytime all wrapped into one. The long table is actually a series of tables, and the meal is served family-style, with platters to share among eight guests. Just within our closest tables, three couples celebrated anniversaries: 29, 25, and 10. Peter's fear of foodie snobbery was (pretty much) unfounded, at least among our tablemates. The was no pretension, no attitude—just sheer pleasure of sharing a gorgeous meal and experience. Denevan's desire to honor the local farmer through OITF is probably my favorite aspect of the evening. The OITF crew ushers the farmers and producers around the long table, introducing them to the diners and telling their stories. I talked heirlooms versus hybrids with the Missy from Jake's Farm while sipping wine under the stars. The spontaneous applause for the growers, artisans, and chefs—as well as a sloppily orchestrated “wave” of cantaloupe cocktail glasses down the long table—proved that Denevan was on to something when he launched OITF. Farmers beamed. Growers glowed. Guests asked artisans for autographs. Sheep bleated, and we all erupted in applause when the wayward lamb caught up with the flock.